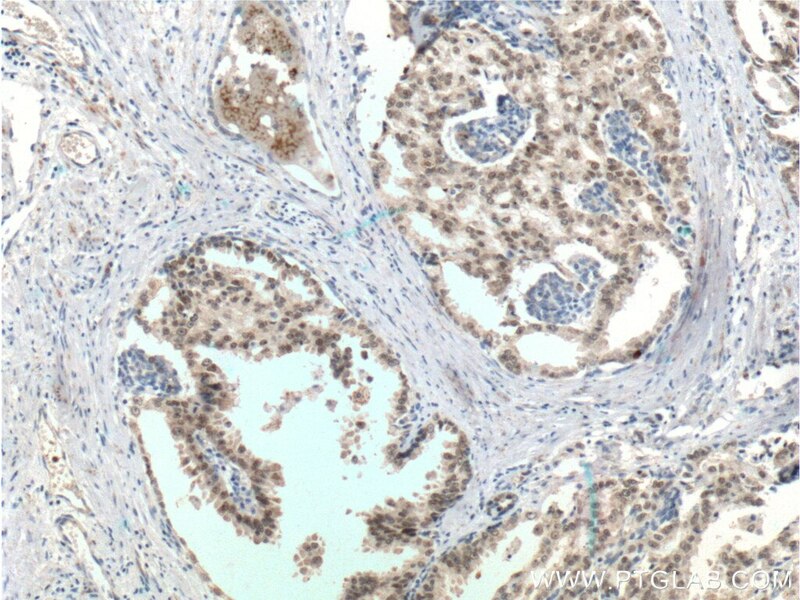 Immunohistochemical analysis of paraffin-embedded human prostate cancer tissue slide using 20411-1-AP( FOXA1 Antibody) at dilution of 1:200 (under 40x lens). heat mediated antigen retrieved with Tris-EDTA buffer(pH9). Forkhead box A1(FOXA1),also named hepatocyte nuclear factor 3-alpha (HNF-3A), is a transcription factor that is involved in embryonic development, establishment of tissue-specific gene expression and regulation of gene expression in differentiated tissues. Is thought to act as a 'pioneer' factor opening the compacted chromatin for other proteins through interactions with nucleosomal core histones and thereby replacing linker histones at target enhancer and/or promoter sites. Binds DNA with the consensus sequence 5'-[AC]A[AT]T[AG]TT[GT][AG][CT]T[CT]-3' (By similarity). Proposed to play a role in translating the epigenetic signatures into cell type-specific enhancer-driven transcriptional programs. Its differential recruitment to chromatin is dependent on distribution of histone H3 methylated at 'Lys-5' (H3K4me2) in estrogen-regulated genes. Involved in the development of multiple endoderm-derived organ systems such as liver, pancreas, lung and prostate; FOXA1 and FOXA2 seem to have at least in part redundant roles (By similarity). Modulates the transcriptional activity of nuclear hormone receptors. Is involved in ESR1-mediated transcription; required for ESR1 binding to the NKX2-1 promoter in breast cancer cells; binds to the RPRM promter and is required for the estrogen-induced repression of RPRM. 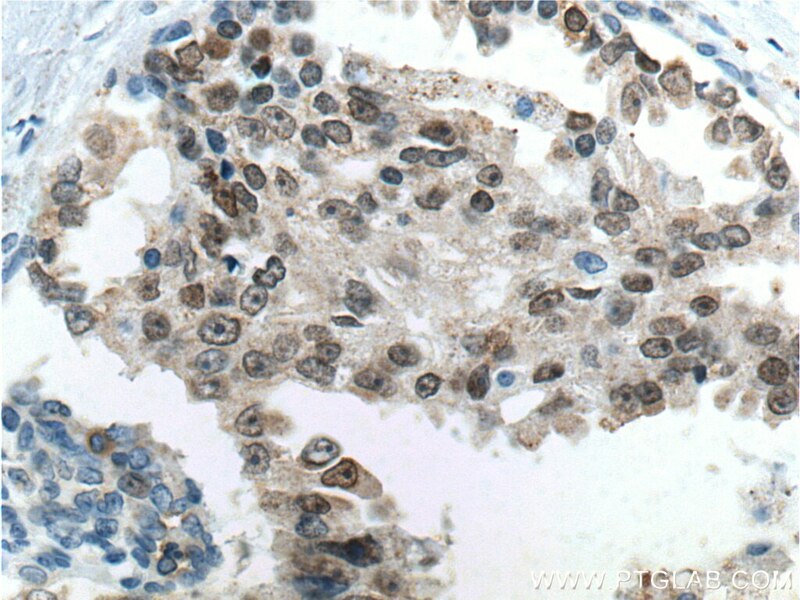 Involved in regulation of apoptosis by inhibiting the expression of BCL2. 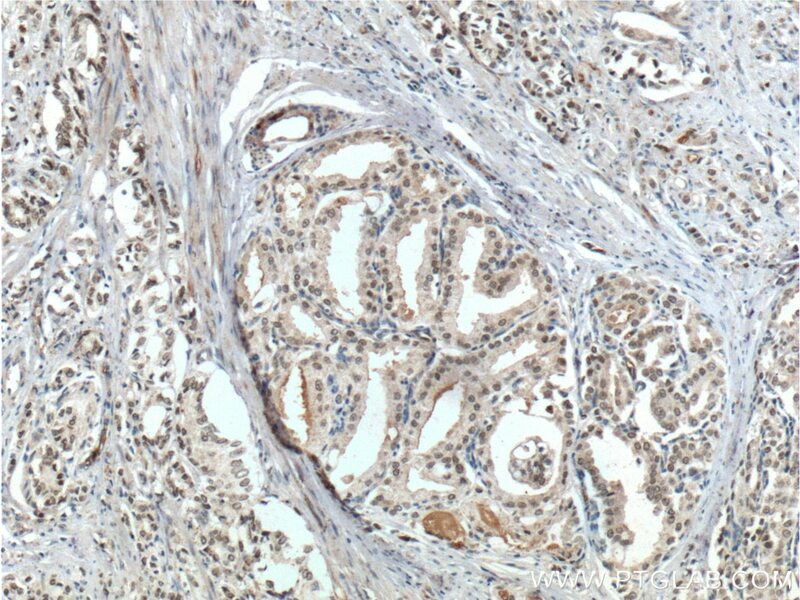 Involved in cell cycle regulation by activating expression of CDKN1B, alone or in conjunction with BRCA1. Originally discribed as a transcription activator for a number of liver genes such as AFP, albumin, tyrosine aminotransferase, PEPCK, etc. Interacts with the cis-acting regulatory regions of these genes. Involved in glucose homeostasis. 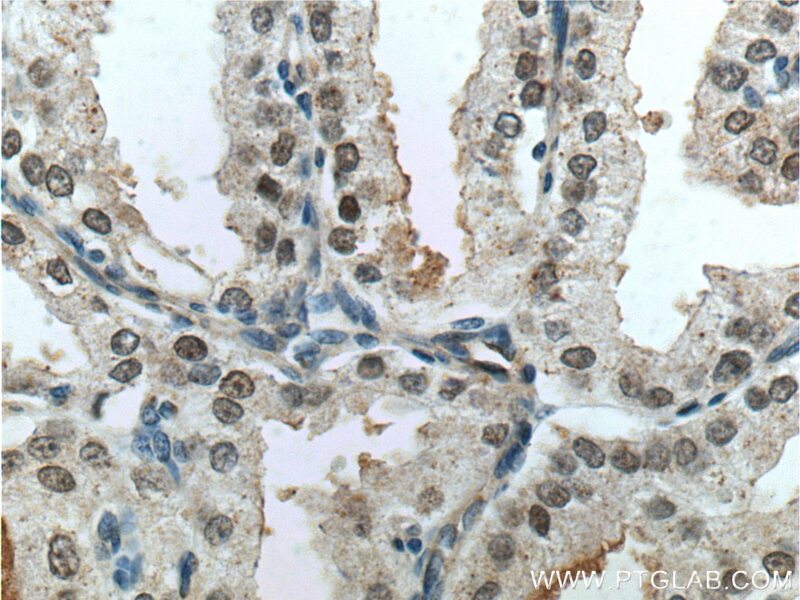 Immunohistochemical analysis of paraffin-embedded human prostate cancer tissue slide using 20411-1-AP( FOXA1 Antibody) at dilution of 1:200 (under 10x lens). heat mediated antigen retrieved with Tris-EDTA buffer(pH9).